Post – Tuesday, 2nd October 2018 (In hand). 1st Aytee Jessie Jay (GSP) handled by Mrs Hari Lampart. Questor Karson of Caldera (GLP) handled by Mr Steve Kimberley. Congratulations to all in the awards and thank you to the host Rory Major and all the competitors for a terrific day. The most significant factor of the 2018 TAN was the extremely hot weather. With virtually no wind or any cloud cover both handlers and dogs sweltered in 30 degree temperatures. Nevertheless we attracted a splendid entry of 22 dogs on the day, which were split into 2 heats for our judges to look at. Each TAN field had two cages of quail secreted in the undergrowth for the dogs to find and point. We started running earlier than scheduled to take advantage of the cooler conditions. Many thanks to both judges for their willingness to do this. Barry’s field was a rough pasture, with plenty of nettle, thistle and dock cover, comprising a narrow strip between a high hedgerow on one side and a wood on the other. Dogs running in this field needed to face cover well. John had a much less favourable field which had been cut for hay only a few days before. This did still have two 10 foot wide strips of long growth on either side and widened into a very open space where extra cover was created with piles of branches. The key here was to get dogs that worked out well to the full width of the cut areas. Both judges were asked to nominate those dogs that they felt merited a second run – which took place in the better field but in the opposite direction this time. Because of the heat, and lack of wind, scent was difficult and a lot of dogs struggled to find birds. This meant that 11 dogs did not earn their TAN diplomas this year, some being more motivated by butterflies than anything else! After the first run five dogs were selected to compete for the prestigious Stan Smith Cup, presented in memory of our founder member. Sadly, despite our efforts, one owner could not be located and only four dogs actually ran. Gefni Mile a Minute (2 year old by Sh Ch Curacao Tank Calzaghe at Sultair x Hawkwise Inayah over Gefni) owned and handled by Laura Winder. Senior judge Barry Hill commented that this dog would have been worthy of any level of HPR competition. Hawkwise Nugget (Rochus Huxley x Hawkise Fair Copy) handled Sue Connolly. = Challowmoon Noah (14 months Tillybirloch Laskar at Challowmoon x Sh Ch Rochus Jorja at Challowmoon) owned by Debbie and Dave Mooney. Noelle of Peaclond (Sh Ch Daraydala Beaumont x Denandmeg Indian Skimmer) owned by Christine Ball. Dave Anderton’s Rochus Hi Pippa, Gregory Barlow-Evans’ Rochus Luna, Brian & Gay Davies Rochus Lottie (litter sisters), Leslie & Mark Poole’s Sanboisier Naos at Laurremar, Guy Potter’s Nyra de Chez Maurice, Ian Swindlehurst’s Rochus Minstrel. Gregory Barlow-Evans won the trophy for best Junior Handler in the TAN. 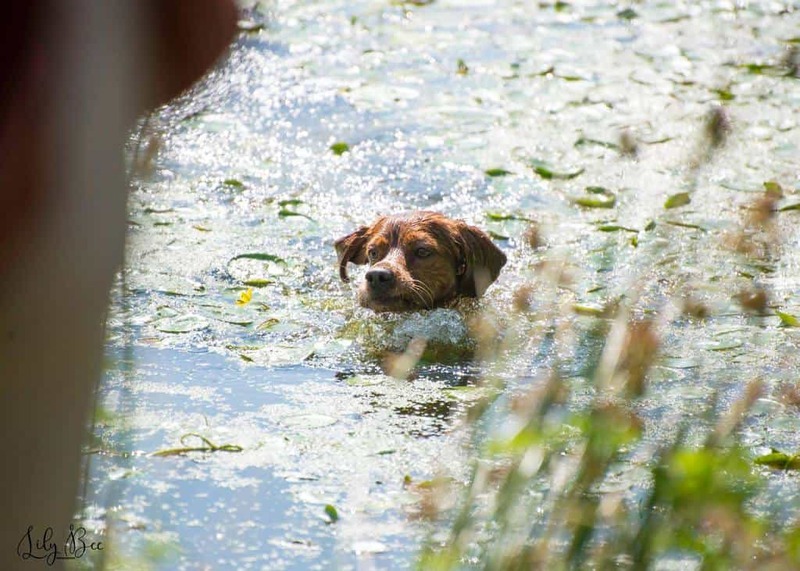 This event is recognised as another test of a dog’s working potential and simply requires a dog to retrieve a dummy from water that requires it to swim. Our ‘water’ this year was troublesome in the extreme. Where an easy entry from the bank was available the water was thick with duck weed and lilies – and further complicated by a family of swans. Where the water was clear the entry was steep, so not conducive to encouraging young dogs. Fortunately this did not deter Fiona Cook’s 5 month old Toby, who was making his Brittany Club debut. He threw himself in and immediately showed a natural and confident style in the water, and retrieved well. Others satisfying the criteria were Guy Potter’s Nyra de Chez Maurice, Mandy Boaz’s Jassendue Liana, Laura Winder’s Gefni Mile a Minute, Sarah Finch’s Jassendue Manet’s Medley am Cetgueli, John Marshall’s Molly, Norma Ansell’s Gefni Maybe Malik, litter sisters Hawkwise Nugget & Hawkwise Nice n’ Easy, Mark Jone’s Bob, Richard Perk’s Jassendue High Lander, Alison Lay’s Tara, Ian Swindlehurst’s Meg & Isla, Ann & Mick Samardzija’s “he won’t go in water” Patouche Lambert, Nick Hayes’ Sanboisier Nevis and finally two spaniels – Paul McEvot’s Harvey and Helena Jone’s Mungo and a Brittany x Setter – John Marshall’s Spot. Competition was based on seen retrieves along a clear track. This competition comprised 3 separate exercises, a split water retrieve (i.e 2 dummies each thrown out some 40 yards apart and the dog having to fetch them in the order required by the judge), a long blind retrieve along the lakeside, and a split retrieve with one dummy being thrown out about 100 yards along the lakeside, and the second thrown well out in the lake. The dog was expected to take the first dummy before looking for the more attractive water retrieve. Although there were not many entries it was extremely keenly contested (there is a bit of friendly rivalry here) and the first three were separated by the smallest of margins. It would be good to make these two competitions more visible as they make exciting and easily understood entertainment. On a hot day there were not many entries and the course included longish grass which slowed times down. The first 2 were however separated by only one hundredth of a second. Richard Perks Jassendue High Lander retained his title from last year. The following is from a list compiled by Alithea Lockie of awards and Certificates of Merit given to brittanys in competition at Kennel Club licensed Field Trials. Every effort has been made to verify the accuracy of the information but the author cannot be held responsible for any errors or omissions or for the consequences arising from such. Anyone wishing to use the information may do so but they should satisfy themselves as to its’ validity. It does not reflect the total number of brittanys that have participated in Field Trials or the number of occasions on which a particular dog has run in trials. Gundog Working Test results do not form part of this survey. The first recorded award granted to a brittany was on the 6.10.1984, when Dorvalstan Ulrick of Riscoris was awarded 3rd place in a novice field trial, handled by Mrs A Lewis. A few months later, on 4.12.1984, they went on to be the first brittany to win a novice field trial; and a few years later, on 13.1.1986 they became the first brittany to win an open field trial and the next year on 30.1.1988 they won their second open field trial to become the first Field Trial Champion Brittany. To date, 21 brittanys have won field trials – 20 have won a novice field trial, 12 have won an all aged trial, and 12 have won an open field trial. The two dogs with the most field trail wins were FtCh Bestobel Hiver (two all aged wins and two open wins) and FtCh Riscoris Fleur De Lys (one novice win, one all aged win and two open wins). The dog with the most field trial awards (including COM) was Dual Champion (Ch.FTCh) Tournesol Destinee at Bryantscroft, who gained 15 awards between 7.10.2011 and 25.10.2012.